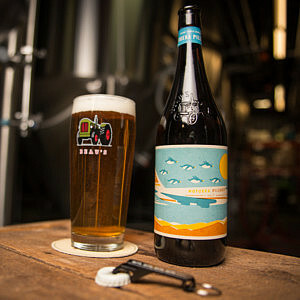 Beau’s Brewing Co. has announced an award-winning recipe making a return as a spring seasonal release in Ontario and Quebec: Altbier, an amber lagered ale. Malty and crisp, Altbier has roots in Dusseldorf, Germany, where it is the much-loved signature beer style of that city. Altbier is something of a cousin to Beau’s flagship Lug Tread, with a more a pronounced malt and hop character but the same characteristic crisp lager finish. A sessionable 4.7 %, it will retail in a 473 ml tall-can. This beer recipe is a true Beau’s classic – in fact, Brewmaster Matthew O’Hara had been tinkering with it even before Beau’s opened its doors in 2006. It was first released in 2008 as Festivale, a signature release for Ottawa’s Jazz Festival. It has popped up several times in the Beau’s repertoire over the past decade, garnering awards in 2009 (Gold, Mondial de la Biere Strasbourg France), and in 2012 (Bronze, Canadian Beer Awards). Last brewed by Beau’s in 2015, it will be a limited release from the back catalogue of fan favourites for spring 2019. Altbier pours bright deep copper with a thick white foam. Malt dominates the aroma giving impressions of dark bread crust with undertones of grassy hops. The flavour features assertive hop bitterness in harmony with a grainy malt backbone. The finish is crisp and dry. Cans of Albier will be available for purchase in the Beau’s Tap Room beginning Feb. 14, and by or before that date at many retail establishments where Beau’s is sold. It will also be sold on draught at select craft-friendly restaurants and pubs in Ontario and Quebec this spring.